Dresden (2006) or Was the Bombing of Dresden a War Crime? 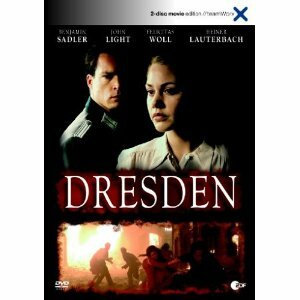 Dresden is a quite controversial German movie that has been criticised a lot. Shot for TV it is basically a very corny love story between a German nurse and an English fighter pilot. I´m not going into any plot details since they are quite boring but still I do think this movie achieved something. The love story takes place during the days before the bombing of Dresden starting February 13 1945 and ends with a depiction of the bombing. This end part as well as all the parts in the English Head Quarters from where the bombing was organised had me glued to the TV screen. The moral conflicts of the British to bomb what they knew to be one of the most beautiful European cities was shown very well. 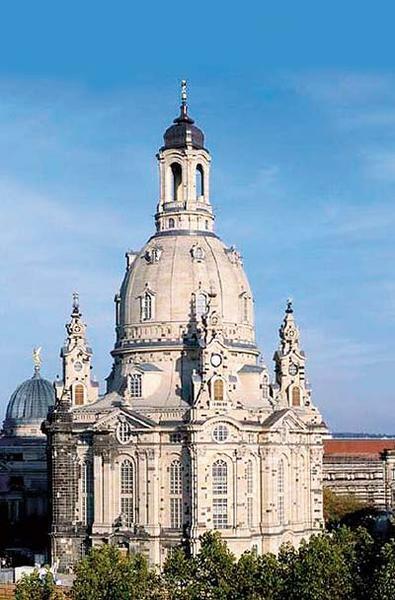 The atrocity of what is still called a war crime nowadays, is symbolised in the collapse of the famous Frauenkirche, one of the town´s landmarks (reconstructed in 2008 as a symbol of hope and peace). 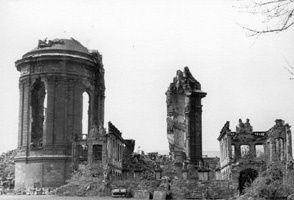 The church withstood two days of bombing and finally collapsed on the second day. The damage the bombing caused, the heatwaves, the firy wind… I think it is shown rather well however varnished with a lot of corny elements. The end of the film shows actual footage, the re-inauguration of the rebuilt Frauenkirche. This movie, as flawed as it is, offers a lot of food for thought. How justified was it to systematically bomb a city like that, to kill so many and to destroy century old architectural treasures? How is this different from the bombing of other cities? Was it unavoidable? Was it a war crime? How did the pilots feel? Further questions circle around the film makers´ choice to mix a corny romance with historical facts. This entry was posted in Reflections, Reviews, WWII and tagged Dresden, Movies, Reviews, The Bombing of Dresden, War Movies, WWII.